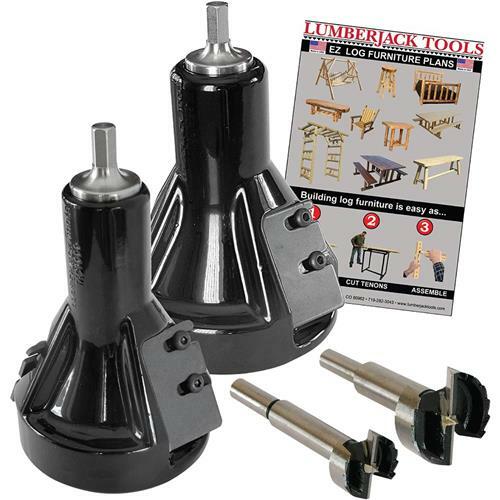 The 1" & 2" Commercial Series Starter Kit is a versatile, dual-purpose package that give you a both small and large tenon joint cutting capabilities. With this medium-duty kit, you can make most log projects including beds, railings, coffee and end tables, chairs, benches and more. Used by homeowners, hobbyists and occasion users, you can cut both structural and non structural joints for your indoor and outdoor projects. Includes the 1" and 2" commercial series tenon cutters, 1" and 2" forstner bit sets, and a 10 Piece EZ Plan Booklet. Maximum tenon length is 3" and maximum log diameter is 3-1/2." Requires a single-speed 1/2" drill, less than 550 RPMS.